I had a lot of fun this summer, but one of the most delightful mornings was spent with five young friends and a 25-foot long solar balloon. Take a look. We had a grand time watching the balloon expand and contract, rise and fall, with changing temperatures (and, OK, having the occasional giant balloon wrestling match), but it made me think about all the interesting experiments you could do with solar balloons. 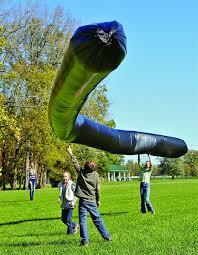 As solar balloon novices, we purchase our balloon from the Steven Spangler Science website. They offer 25 and 50-foot bags. I wonder how their behavior would compare? What if you cut the 25-foot balloon in half? Which would float higher or move faster? Or, you could design your own solar balloons. There are several websites to teach you how. Wiki-How has a four-trash-bag version while Instructables uses about seven. How would the two versions compare? If you have access to trash bags, sun, and a wide open space, solar balloons can offer a great opportunity to structure experiments and postulate relevant variables. One young man did just that, tracking the height, speed and distances attained by varied balloons. Here’s his video. As inspiring as it is, I DO NOT recommend any experiments that involve launching these balloons. They are literally large enough to interfere with air traffic and could be dangerous to those on board aircraft. So keep your balloons safely tethered and measure the height attained. You don’t want to end up on the news. Watch what happened when an AP science class project got away. You don’t want to do this. Really.